Pimples, the bane of every girl's fabulous life. You could plan all you want for the perfect night out and then out comes a random red zit that makes you go RWARRR (well i do). A good skincare regime helps with that but i'm really no frills (lazy) when it comes to that. I was recently convinced by Yanni, my pretty doctor friend, to visit her at The DRx Clinic for a consultation and she promised that she'll make me prettier. Heh. 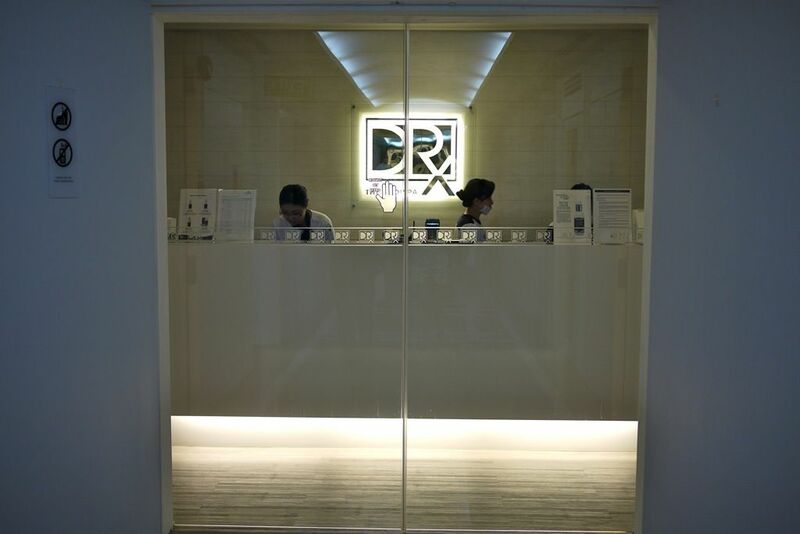 DRx is centrally located on the 16th floor of Tong Building in Orchard, right next to Paragon. I felt like i was transported to the future once i stepped into the pristine white environment. The service staff signed me in while i waited to be shown around. I've never seen Yanni at work before but she's the same bubbly and friendly babe to her patients too. Telepathy between friends! We happened to be in floral prints for the day. :) So anyway, she whipped out her magnifying glass and donned her surgical gloves to scrutinize my face. 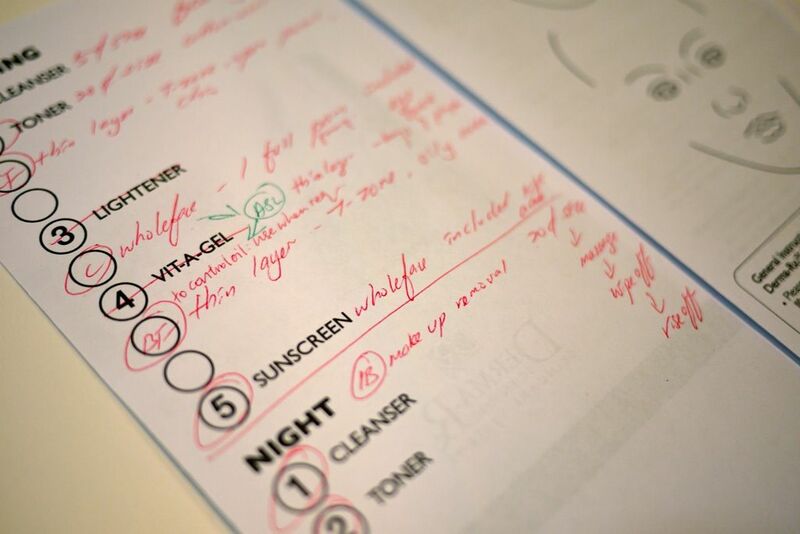 Obviously i got nagged at when i explained my skincare routine (or lack thereof). I'm a boy when it comes to stuff like that. I was using the Avene cleanser (as recommended by the senior consultant at NSC), together with my Clarisonic brush and that was all. No toner, no moisturizer, no sun screen. I can hear your gasping in horror already.. :/ Well.. i didn't see the need to and it takes up sooo much time! Meh. Yanni suggested that i use the Derma-Rx products to prep my skin before we move on to any other treatments. 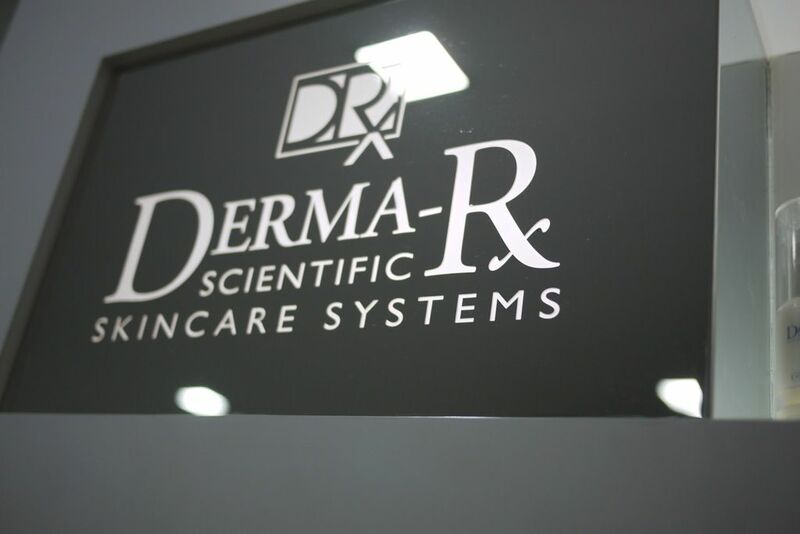 The Derma-Rx range is exclusive to Derma-Rx affiliated clinics around the world and prescribed by medical doctors. Their skincare programs are based on a tried and tested system that have delivered results for countless patients from all over the world for a myriad of conditions from pigmentation disorders to acne, pores and scars to fine lines, wrinkling and other aging symptoms. After the consultation, i had my face photographed so that we could do a comparison study at the follow up session. I haven't seen the before pictures but i'll consider posting it up next time. Then Lorna, the CSO sat me down to explain the various products to me. I have been tasked to apply 7 different products on my face every night and day and there are steps for that! Oh the horror! To get the steps into the patient's head, especially one as lazy as i am, a pictorial instructional sheet would be given to you. Lorna was clear in explaining what each product does and how to apply it on my face. 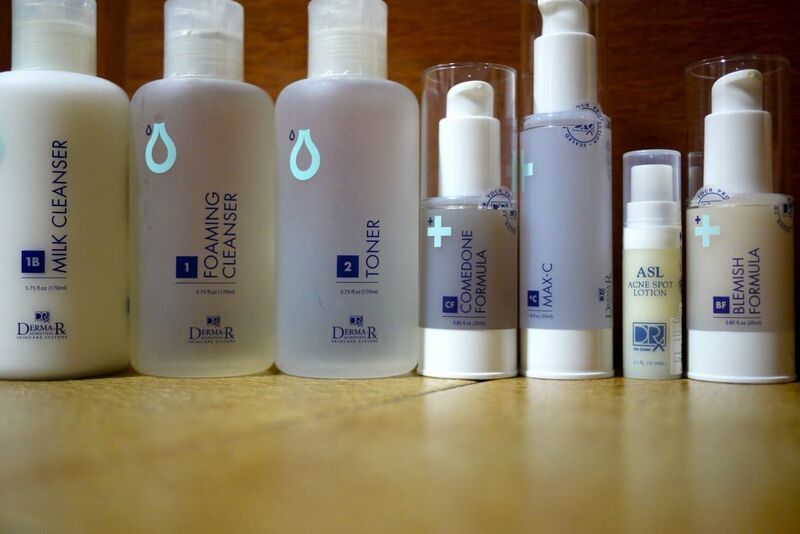 So here are the products that i've been religiously using for the past couple of weeks. The order is from left to right. Step 1: Milk Cleanser 1B ($45) to remove make up. Even though i only use a cream concealer and occasional mineral powder and blush for my face, this milk cleanser will ensure all impurities are removed at night when my skin is resting. It contains Papaya and Mulberry extract to soothe and lighten the skin, it soothes and lightens the skin, leaving it soft and velvety smooth. Step 2: Foaming Cleanser 1 ($40) is a hydrating cleanser for all skin types and it contains Marine Algae extracts to gently exfoliate the face. Step 3: Toner 2 ($40) is an alcohol free with Glycolic and Salicylic acid. Do not use an alcohol based toner e.g. SKII if you have oily skin. That will give you pimples. This contains Allantoin to restore moisture to the skin as well. Step 5: MAX-C *C ($158) is a potent anti-oxidant formula based on the highest possible stable concentration of Vitamin C. It counteracts free radicals, encourages collagen and elastin production to control the adverse effects of photo-damage, including wrinkling, sagging and other symptoms of premature skin aging. This was prescribed to help me even out my skin tone and texture. It also has a whitening effect. I apply this to my whole face and neck. Step 6: Acne Spot Lotion ASL1 ($25) is used on those angry hormonal spots. The redness goes away a lot quicker than using a prescribed pimple cream like Epiduo. Like! Step 7: Blemish Formula BF ($70) is applied to the T zone and oily areas to control and reduce occurrence of blemishes and breakouts. I was also reminded again the importance of sun screen. I hate using sun screen because they are so oily! Boo.. Nevertheless, i've been slapping my face with a ton of sunscreen (from DRx as well, $58) before i leave the house every morning. I swear i'm turning into Snow White already. This is such a 180 change from my brownie days from playing Hockey and suntanning. The products have been working fine for me so far. Stay tune for my follow up treatments. DRx also offers many other non invasive treatments like Botox, fillers, lasers and ultherapy. 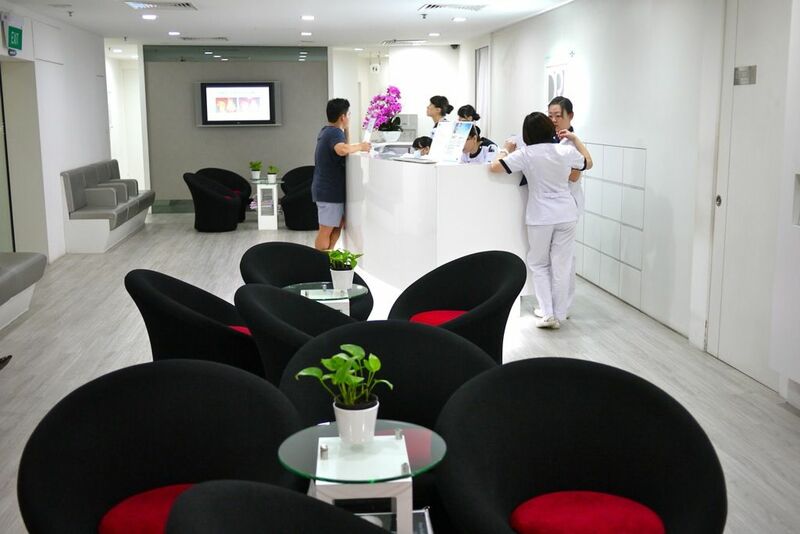 In addition to that, they also have a medical spa that does facials and they even tackle hair loss! More on that next time round. Hi Mylene, I've updated the prices in the post. :) more to come soon!